American Airlines is claiming to be the first North American airline to begin testing a new in-flight streaming video product from Aircell. The new product will allow customers to wirelessly stream content such as movies and TV shows from an in-flight library to their personal Wi-Fi-enabled devices. Unfortunately, the airline did not reveal what content the library contains, nor did it disclose pricing for the new streaming video offering. Both will be revealed closer to launch. American Airlines is currently testing the new in-flight video system on two Boeing 767-200 aircraft in transcontinental service. The company plans to begin customer testing early this summer and to roll out the product on Wi-Fi-enabled aircraft starting this fall (pending FAA certifications). The streaming video offering is American Airlines' latest investment in mobile technology.Back in August 2008, American Airlines launched its in-flight Wi-Fi service called GoGo, which is also provided by Aircell's air-to-ground system (three small antennas installed outside the aircraft that connect to Aircell's nationwide mobile broadband network). 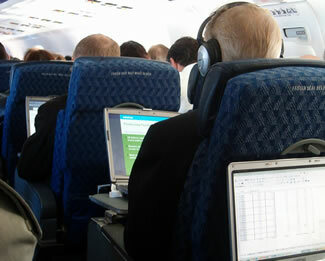 The airline further expanded the Wi-Fi service in April 2009. In addition to the video streaming system, American Airlines wants to expand the Wi-Fi service once again to its narrow body fleet, including additional MD80 and domestic Boeing 757-200 aircraft. This will make the Wi-Fi offering available on all of the company's domestic aircraft dedicated to flying within the continental United States. The Wi-Fi expansion will include 93 domestic 757s and up to 50 additional MD80 aircraft. Installation will begin this summer and continue through 2012. Last but not least, the airline is still installing Wi-Fi service on its entire fleet of 737-800 aircraft. "Once again, American leads the industry in providing innovative options to keep customers connected, productive and entertained," Rob Friedman, American Airlines' Vice President of Marketing, said in a statement. "American was the first North American airline to launch in-flight Wi-Fi, and today we again set a new industry standard as the first domestic airline to test in-flight streaming video content. We know our customers want to be connected on the ground and in the sky, so we are working hard to stay on the leading edge of connectivity through technology enhancements like this."